Are you looking for a place to connect with other women? 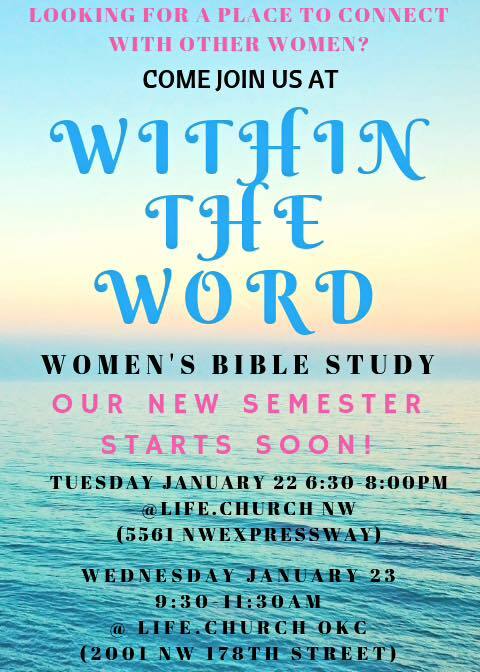 Join us at Within the Word, a women’s Bible Study. We are studying the book of Acts! We meet at two locations. Join us on Tuesday’s at 6:30pm at Life.Church NW (5561 NW Expressway) or Wednesday mornings at 9:30am at Life.Church OKC (2001 NW 178th Street) All women are welcome!! No need to RSVP, just show up and we will give you all the material you need.